Michell’s new S8000 RS has been designed to provide fundamental, dependable measurements in a range of industrial applications where highest precision of the dry gas measurement is critical and the ease of use is essential. It is the smallest and among the lightest instruments on the market which is capable of measuring dry dew points precisely to -90°C (0.1ppmv) with no need for additional, external cooling equipment. Combined with its 0.1°C accuracy this also makes it the most cost-effective as well as convenient hygrometer in its class. Chilled mirror hygrometers have excellent accuracy and repeatability because they base their measurements on the actual formation of condensed water or frost on a mirror surface. This is a primary characteristic of moisture so will not drift over time, as can occur with calculated or inferred variables. The S8000 RS has a sophisticated new optical system that detects very small changes in moisture condensed on the mirror surface. This guarantees high sensitivity and fast response when measuring low-dew points. As with all Michell chilled mirror hygrometers, the S8000 RS is available with UKAS and NIST accrediation. With a high-contrast LCD touch-screen, the S8000 RS is easy to operate and interrogate. USB or Ethernet connections are supplied as standard to enable remote operation and data logging via a PC or network. The robust overall design and practical features like alarms make the S8000 RS Reference hygrometer a multi-purpose tool for a wide range of applications in an industrial environment as well as for calibration facilities. Michell supplies precision hygrometers and is the largest dew point sensors manufacturer in Europe. Their reference chilled mirror hygrometers, such as the S8000 RS, are constantly in use within their own factory for dew-point sensor manufacturing, and their 24/7 calibration facility and service. Michell’s customers benefit from the robustness and 40 years of expertise built into each chilled mirror hygrometer design. Reference instrument for calibration laboratory. 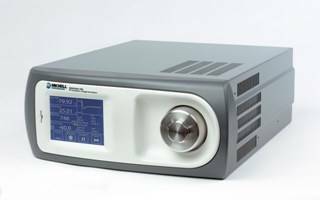 Compact, light and needing no additional cooling – it is ideal for small in-house calibration laboratories. Verifying the purity of industrial gases. Its fast response and high sensitivity enables quick measurements to be taken. Ensuring the dryness of controlled industrial environments.